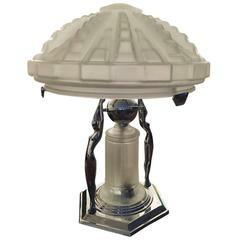 Stylish Art Deco two lights polished brass table lamp. France, 1930s. 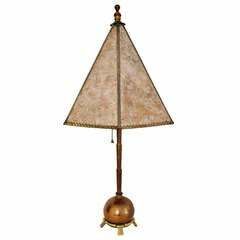 The column body of this lamp holds its original antique funny paper shade with stamps and letters. The brass has been polished and varnished. Sold with shade. Measures without shade: Height 92 cm, diameter 15cm. With shade: Height 92, diameter 42cm. 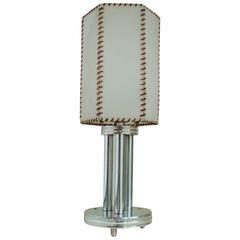 The lamp shade has a big stain at the back part and some soft stains but it still remains highly decorative and funny. Shipping quote estimate for a shipment shade included. 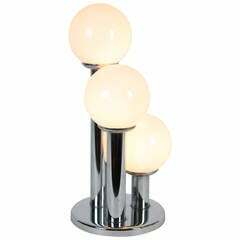 A beautiful table lamp with three chrome columns in different heights holding opaline glass globes. France, 1960s. 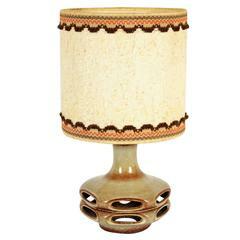 Amazing Stein Keramik Fat lava table lamp with original vintage shade. Very decorative light effect. Two E14 bulbs, new rewired. 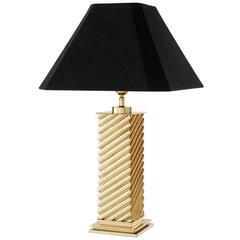 Table lamp column in polished brass with black shade. 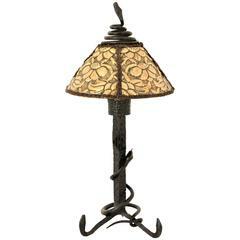 Available in antique bronze finish. KEM Weber, Mutual Sunset Lamp Co. 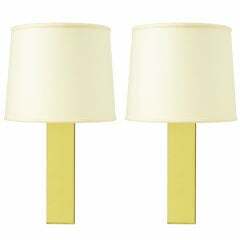 Pair of polished brass column bodied table lamps with brass stems and brass socket.